I love this. It's simple. Takes 15 seconds and zero instructions to learn to use. You can play with it for at least 5 minutes without getting bored. 15 minutes before you realize that you were supposed to be doing something else. Too often we abuse technology to make our consumer experiences cool or cutting edge. Complexity kills you on the Internet. Too many added features and users just won't use them. So strip down your rich media banners, your widgets, your embeddable tools, your viral streaming microsites. Instead provide what consumers have always wanted = simplicity. So the IAB just launched their first POV on measuring social media effectiveness (PDF version here). The hope is to pull our industry kicking and screaming out of CTRs and CPMs into more robust measurement criteria. In other words, compared to old-time metrics like reach, frequency and the click-through, these metrics are deep, not only measuring whether people are engaged, but how they are engaging. It's like being able to measure the temperature with a thermometer rather than opening the front door and declaring it either hot or cold. Imagine that you're an advertiser who sorely needs to understand social media. Then imagine yourself suddenly finding that you can not only monitor discussion around a certain topic near and dear to your brand but that you can also mention the number of people talking about it and their level of passion. Suddenly, social media goes from a huge, indefinable blob of conversations into something that has contours around which you can engage, plan and buy. That's huge. The number of relevant actions, including newsfeed items posted, comments posted, uploads, poll votes, and so forth. Conversation size, which measures the number of content relevant sites and content relevant links, and the monthly uniques spread across those conversations. Site relevance, which measures the density with which phrases specific to a client concern are brought up among relevant sites. Author credibility, such as how relevant the author's content is and how often it is linked to. Content freshness and relevance, which defines how frequently an author posts. The average number of friends among users of a specific application. Number of people currently using an application. And you thought explaining rich media banner engagement metrics was tough? Marketers are continually screaming for simplicity when it comes to online metrics. The reason CPMs and CTRs still dominate is because they are easy to understand and measure. Hence the latest Key Performance Indicators (KPI) trend. Yet they also find comfort in knowing that every online effort can be measured 1000 different ways. Just please put those charts in the Appendix so we don't have to go through them. Who will provide the benchmark for Content Relevance/Posting Frequency (your CR:PF ratio)? Does a Conversation Size include paid media impressions, or is it only the "free" ones? Can you track those conversations back to a paid media stimulus, thus defining a Cost Per Conversation (CPC) efficiency? Did it increase purchase intent? We repeatedly drive new online trends to the brink of complexity before pulling back to more attainable measurement criteria. Perhaps this is due to constantly justifying the existence of any new online marketing opportunity. Beat it to death with an avalanche of metrics, just to prove we can. Then once everyone is comfortable restrain it back to the two or three that really matter. "There’s a bunch of crimes that happened here. Wow there’s an armed robbery right on Briar. Someone reviewed the new cupcake place that just opened. What else is interesting – I can filter to foreclosures." On the screen I can see there were six foreclosures filed on one day in April – a little glimpse into how the housing crisis is hitting this area. Tracking foreclosures may sound tedious, but it’s precisely by sifting and sorting small pieces of data that EveryBlock is creating such excitement. 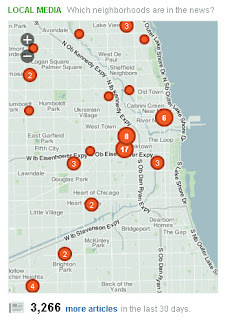 The site locates that data, on a given block, within the limits of a particular city, as fast as it becomes available. To Holovaty, any new information in the public realm - not just news stories but internet reviews, public records like crime stats and building per, or personal photographs - is news. One-stop access to localized content/news isn't a new trend. Microsoft started up Sidewalk.com 10 years ago. AOL's Digital Cities was even earlier. But those sites were directly reliant on paying people to provide the local content; usually via newspaper content feeds or freelance writers. Those sites were only as good as those creating the content. Now there is a flood of both professional and user-generated localized content online, the search technology to find and compile it, and the personal devices to deliver it 24 hours a day. But what happens when the Always On Generation -- raised on a steady stream of Facebook updates and Twitter tweets -- applies the same voracious appetite for real-time content to news about their neighborhood? Will we become digital versions of those guys glued to their police scanners, waiting for a convenience store robbery car chase? Does having your iPhone beep when you pass a neighbor's house in foreclosure really make you a better local citizen? And what about the declaration that anything is news? Does a cupcake restaurant review demand the same priority as a mugging down the block? Should video of a three alarm fire compete with video from your block party? The melting pot of public vs personal news will be very interesting to watch. The latest trends in real-time social media have taught us the difficulty in turning off the information firehouse once it starts. Opening up the corner fire hydrants on a hot day may be fun for awhile, at least until your basement starts flooding. The real challenge is not drowning in your own front yard. Is it just me, or does Ad Age eventually cram everything Dotcom into a broadcast model to comprehend it? 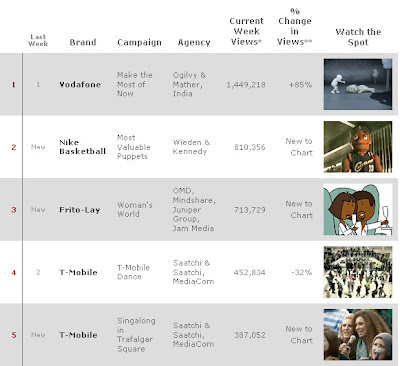 Even though Viral Videos are soooooo 2007, they launched their weekly Viral Video Top 10 Chart for tracking online video popularity. This allows agency Creatives to keep track of which clients allow their agencies to produce video beyond standard TV spots. Let's be honest, the main reason creatives enjoy creating online videos (with the intent to go viral) is because they are allowed to actually be creative. No 30 second limitations. No procurement battles over Director costs. No 6+ months of animatic testing to wring every last drop of brand effectiveness out to them. This newfound Viral Video Freedom is quickly being pulled back into the traditional mindset. Used to be that viral videos = cheap production. Which in term = low risk. Which in term = minimal expectations for performance. Got a viral video on Youtube with only 30,000 views? No worries, look how funny it is! And how cheap compared to broadcast! Plus it finally gave the client marketing team a reason for IT to unblock FunnyOrDie.com. But now viral video production values are growing. The guerrilla-style hand camera video -- shot by a couple Art Directors -- is now more polished and has a soundtrack (and more often an actual Director). What used to cost $30,000 to produce now costs $300,000. Measurement like Ad Age's charts give marketers the data to start comparing the total views with these rising costs. It won't be long before a Media agency starts assigning TRPs to them, jargon which brand managers actually understand. At which point the game is over. Because TRPs and CPMs quickly lead to direct comparisons with 30 second prime time slots. Which leads to marketers needing to justify viral video effectiveness. Which leads to consumer testing and guaranteed online impressions. At which point you've completely lost track of the initial purpose for the Wild Wild West known as Viral. This doesn't mean that long-form online video is dead. I'm sure the Creatives will find another reason for an extended stay at Shutters on the Beach. Although after the 3rd round of viral video animatics, they may be pining for the days when 30 second spots were king. Should You Pay For An Ad Impression That Doesn't Actually Leave One? Despite the astronomical number of banner ads that I have personally thrust into the Internet over the last 15 years; I still look forward to the day that banner advertising dies off. Disappears. Ceases to exist. Extinct to the point that CPM and CTR and 25K 3-loop with backup GIF become undecipherable words of a bygone era. Kind of like CGI-bin, server-side push, and <blink> tags. What are those you ask? Exactly. 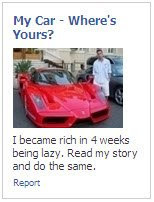 I hate banner ads. Yeah yeah I know they are a necessary evil, carrying us through the recession, and the backbone of your online media program. I know they are practically the only online advertising standard that everyone can agree on. Some of you probably even won awards for them. But my main issue is this: no one pays attention to them. Sure 1 out of 1,000 people actually click them (industry average CTR is now 0.1%). And your ad effectiveness research reveals that results greatly improve if you put the logo in every frame and the call to action at the top. And declining CPMs will reach the point where they are basically added value anyway. But it still doesn't change my POV that no one pays attention to them. Seriously, when is the last time you clicked a banner ad? How many do you remember from the last site you visited, prior to reading this entry? Not including those damn repetitive Facebook text ads drilled into your brain after staring at them for 3 hours straight. 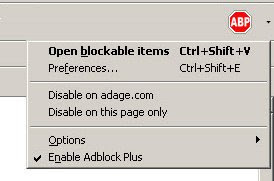 For kicks I installed the banner blocker AdBlock Plus in my Firefox browser. A simple installation that now eliminates banners on 80% of the sites I visit. I'm a two-fisted browser man, equally using IE and Firefox throughout the day. For the last month I've been heavily using the Interweb approximately 50% with ads and 50% without. I've come to realize the funniest damn thing. I don't even notice that the Firefox versions of sites lack banners. I thought it would be such a liberating experience. But the only time I notice is when I'm actually looking for a banner (checking my brand media placements, looking for competitor examples). Then I realize there aren't any and switch over to IE. But otherwise it has no direct impact on my browsing satisfaction. 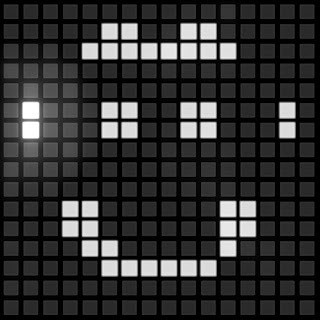 Anything that animates in a square frame is automatically blind spotted and ignored. So maybe mass acceptance of adblockers would drive our industry to its knees. Maybe it would force us to truly innovate and develop online advertising models that don't rely on mass spewing of animated images in a desperate attempt to get noticed. Maybe the smart marketers will recognize that adblockers are already embedded in our consumers' brains, no plugin download required. For the rest of you, download the Firefox plugin and give it a test run. Isn't that the same guy who hides used syringes under gas pump handles? 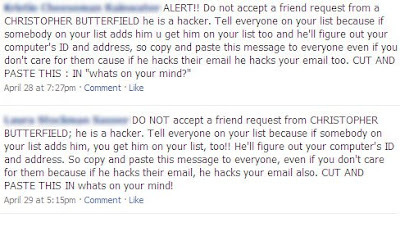 It is interesting to watch the viral spread in real time, as other Fbook friends repost the same cut-n-paste warning. You know the drill. Someone posts it, others repost, someone debunks it, it shows up 3 months later with a slightly different plot. Two years later your parents warn you about it. Phishing is also affecting Fbook email users. The last two weeks have seen a huge increase in Facebook email phishing attacks. Get a random link from your friend, click it, and go to a fake Fbook page asking you to log in again. Give up you username/password and within seconds all your Fbook friends receive the same email message/link. 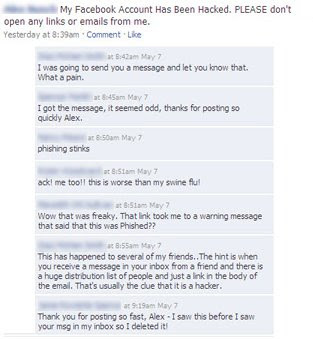 Then publicly apologize to all your friends, thus admitting your susceptibility to anything with a hyperlink. Rinse and repeat. These phishers get extra credit for bundling password scamming with email spamming, specifically to a group who has been "protected" from spam via the closed Fbook network. What's next? Viruses from picking your Top 5 Things No One Else Cares About? Those are just fun little quizes and games, right? Well -- unlike those Free Screensaver downloads that fostered widespread installation of annoying adware and pop-up ads -- these cute little Fbook apps have the potential to do a whole lot more harm. Have you ever thought twice about clicking Allow before playing with them? The move would allow developers to build applications and services that -- with users' permission -- access user videos, photos, notes, and comments. The move would be a significant change for the social-networking site, which had previously retained tight control over the site and how developers interact with it. To allow developers to take advantage of the free feature, Facebook users would have to give the companies access to their data, and users' privacy settings would extend to new services built, according to the report. All it takes is one rogue developer to create an awesome fun-to-use app, which gets spread across the Fbook universe, only to have it turn into a private info carnivore. Maybe a virtual screensaver that pulls images from your friends' Fbook photo albums, but behind-the-scenes is also reading all your Fbook email messages? Or analyzing your status posts to determine when you will be out of town for an extended time? But at least the damage would be contained to Facebook.com. Unless you consider Facebook Connect, which allows you to extend your Fbook personae to other websites. Primarily by logging onto those site with your Fbook username/password, allowing you to interact with your Fbook friends there, or push site content/actions back to your Fbook page. Red Bull has a good example. Sure this might all be unnecessary paranoia, but hackers love a challenge. Fbook's pristine natural private Utopia is just begging to be deflowered. Try not to get knocked up in the process.